An Episode Of What TV Show Sent Hundreds Of Children To The Hospital? There was a brief and curious period in the 1980s when game producers ran wild with the concept of interactive video games that were, quite literally, video-based. These interactive movies were only made practical by the rise of the laserdisc format (and later, the ubiquitous CD-ROM drives in personal computers). The very premise of the genre was simple: patch together actual animation or live video footage on a video disc, use the menu system as a framework for the game itself, and then weave the whole thing together like a video-based version of those Choose Your Own Adventure books—except instead of flipping to page 39 to shoot a fireball at the wizard, you made a selection with the disc player’s remote and the disc skipped to track 39 instead. 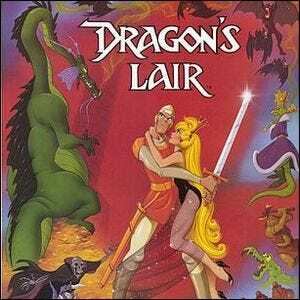 Although it wasn’t the first example in the laserdisc game genre (that distinction belongs to the laserdisc game Astron Belt, developed by Sega in 1982), the game that served to popularize the genre in the United States and remained the most popular example in that genre, was Dragon’s Lair, a 1983 title from the now defunct publishing house Cinematronics. Players were entranced by the game, which combined quality animation created by ex-Disney animator Don Bluth and a decent storyline to move the action along. For arcade goers used to chasing low-resolution sprites across the screen, the large storage capacity of the laserdisc system capable of delivering hours of high resolution (for the time) video and smooth motion was mind blowing. Other laserdisc games tried to capitalize on the popularity of Dragon’s Lair, but creating entirely new content was very time consuming and expensive. Many publishing houses tried to cut corners by hacking together existing movie footage and writing a story on top of it (Japanese anime films that would be unknown to 1980s-era Americans were a common source of existing animation clips for these games). But without the kind of direction and original animation found in Dragon’s Lair, they simply failed to catch the imagination of most gamers.